Use iPads or Android tablets to capture data from people at live events and brand activations. Our in-person surveys are easy to create, fun to complete, and don't need an internet connection. 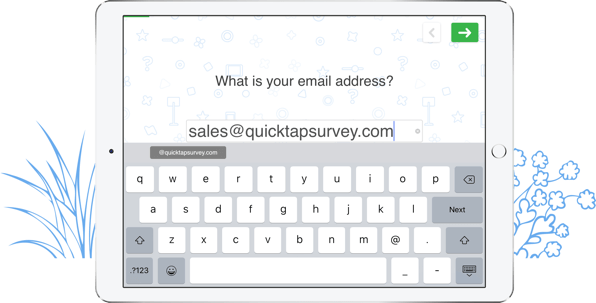 By using QuickTapSurvey, you can collect actionable data you can rely on. Simplify your event data collection online or offline anywhere. The data will sync to QuickTapSurvey’s secure system once you have an internet connection. Event data capture made simple. Create and design the perfect data capture survey in minutes. Unlimited surveys and responses available on all data plans. When offline, data is safely stored in the app until the device is connected online. Collect survey responses with iPads, iPhones, and Android tablets or phones. Send your surveys to a device located anywhere in the world. Get started without any technical expertise whatsoever to capture the data you need from your next event. Data is secure on the device, at QuickTapSurvey.com, and in transit. Capture the data offline at your event and securely upload it when you have an internet connection. Use a single device or a thousand to capture event data and manage your collected info in one place. Our data capture surveys are fully customizable and ready for your event. Challenge: Manual data entry took employees a full day. 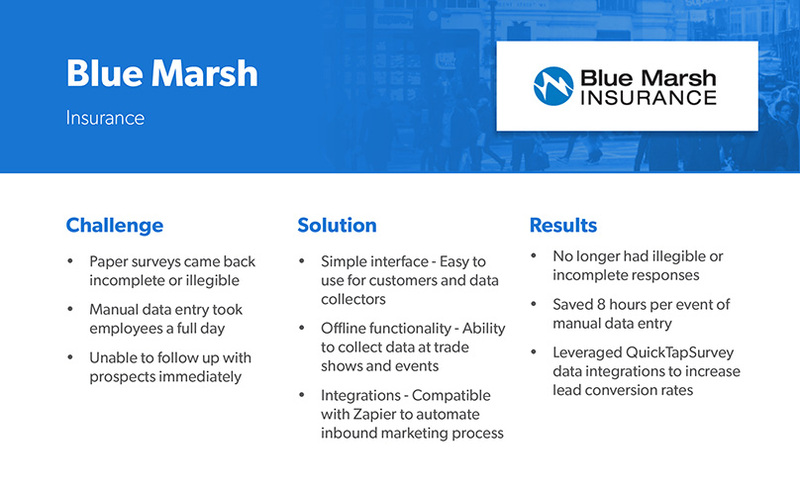 Results: QuickTapSurvey helped Blue Marsh Insurance save 8 hours of data entry per event. Hear from the people who matter most - our customers.